Knocking on doors in District 20 will introduce you to national-level union bosses, campaigners for Nepal, law professors, and hundreds of professionals committed to social justice. Our community is lucky to have so many people who care, but unfortunately, they are not always people who know. They may not know D20 is home to the largest concentration of poverty in Montgomery County, or that the majority of children in public school qualify for free and reduced-price meals. They may know we’re diverse, but cannot name 10 Black or Brown people whose families form the majority of the population. I can’t knock any of the names under consideration for our soon to be vacant Senate seat, I know most of them well and can say they legitimately care. Will Smith, however, has demonstrated the deepest connections to every corner of District 20. I first met Will while volunteering for IMPACT Silver Spring, where he worked with AmeriCorps connecting our most vulnerable neighbors with social services. He and I later chaired Montgomery County’s Community Development Advisory Committee, which decides how to allocate several million dollars of federal funding to organizations serving marginalized communities. Will has planted strong roots across populations that don’t always show up at the voting booth through long-term work with Gapbusters Learning Center and Gandhi Brigade. And I don’t just mean to say that Will knows African-Americans, he started a scholarship fund for immigrant youth who did not qualify for most grants and scholarships because of their status. He is a natural problem solver who has taken his commitment to people at the margins from this community to the state legislature. Will has already established himself as a leader in Annapolis. In fact, Delegate Smith passed more pieces of legislation last year than any other freshman legislator and was a strong supporter and leader in getting the Second Chance Act passed. He sponsored legislation creating tax incentives for employers who hire returning citizens (ex-offenders) and worked to create a reporting system for SWAT team deployments in communities of color. As important, Will was appointed by the House Speaker to serve on two important working groups on justice reinvestment (think: reducing mass incarceration) and reforming the Law Enforcement Officers Bill of Rights (think: establishing civilian review of police misconduct). Will already has the confidence of leaders in Annapolis to represent the interests of people at the edge. Jamie Raskin always claimed the mantle of the effective progressive – he didn’t just talk a good game, he got things done for people that need advocates to get things done. Will has made building the necessary relationships to be effective a priority and will be the effective leader D20 needs in the State Senate. It would be a big deal to send an African-American to the Senate from Montgomery because we have never done it before. But Will represents much more than that. I think people need to understand that Will is the first member of his family to graduate from college, a dream shared by many of the young D20 residents eating free lunch each day. His service as a Naval Officer and journey to Obama appointee and civil rights attorney is relatively unique, even in Montgomery County (where only half of high school grads attend college). Half of arrests in MoCo are of black men, despite blacks making up roughly 19% of the population (34% in D20). Quite frankly, the American dream is at risk here as much as anywhere else. Will is unquestionably progressive and unquestionably qualified, but also brings a set of experiences that are unlike any other Senator from Montgomery. We need his voice at the table in the Senate and that is why I enthusiastically support Will Smith for Senate! I received the following response from Terrill North to Del. Eric Luedtke’s post about the needs of the northern end of Montgomery County Council District 5. Like Evan Glass, he is a candidate for this open council seat. I’m glad Del. Luedtke is paying attention, but as the unnamed candidate he mentioned canvassing the area I’d like to add a few details. I began talking with my neighbors in Burtonsville “officially” in 2010 when I led Impact Silver Spring’s efforts knocking on over 4500 doors and meeting with community leaders examining local needs. · better job opportunities for adults. That year (with seed money from Councilmember Navarro), we expanded Impact’s afterschool program (then serving 60-90 kids in Long Branch) to East County (now serving over 400 youth primarily in East County). This year, we worked with a coalition of stakeholders to launch the first workforce development program serving East County (so local residents could benefit from job opportunities coming with the FDA Science Center). We are also currently working to bring Montgomery College continuing education programs to the East County Regional Services Center. I’m already enacting the plan for East County based on resident concerns. As a candidate, spending a lot of time in East County is second nature to me because most of my in-laws live there; I’ve been hearing their concerns without asking since long before 2010! Since my campaign kick-off at Cuba de Ayer on Route 198 in February, I have been actively engaging Burtonsville voters (and non-voters). I will be in White Oak this weekend meeting with 230 families from another multi-cultural youth program I work with, structuring a summer day camp featuring sports, meals, and academics (modeled on the program I saved from Bush Administration cuts in 2007 as a Hill staffer). That’s after judging an oratorical contest for East County youth that morning (1st annual competition of MoCo youth in the Baltimore Urban Debate League). I will disagree with Eric about one thing, I don’t think East County is ignored. The key, however, is that residents need to vote! The precinct at Greencastle Elementary had an 8% turnout in the 2010 local primary, compared to 40% at Takoma Park Elementary. I spoke at a D14 Democratic Club forum last week where the only Burtonsville residents in attendance were candidates for central committee. The more folks vote, the more quickly issues will be addressed. I develop institutions that improve the lives of District Five residents wherever they live. I put as much effort into establishing a workforce development program in East County as securing over $1 million for stormwater mitigation in Takoma Park. Best of both worlds! 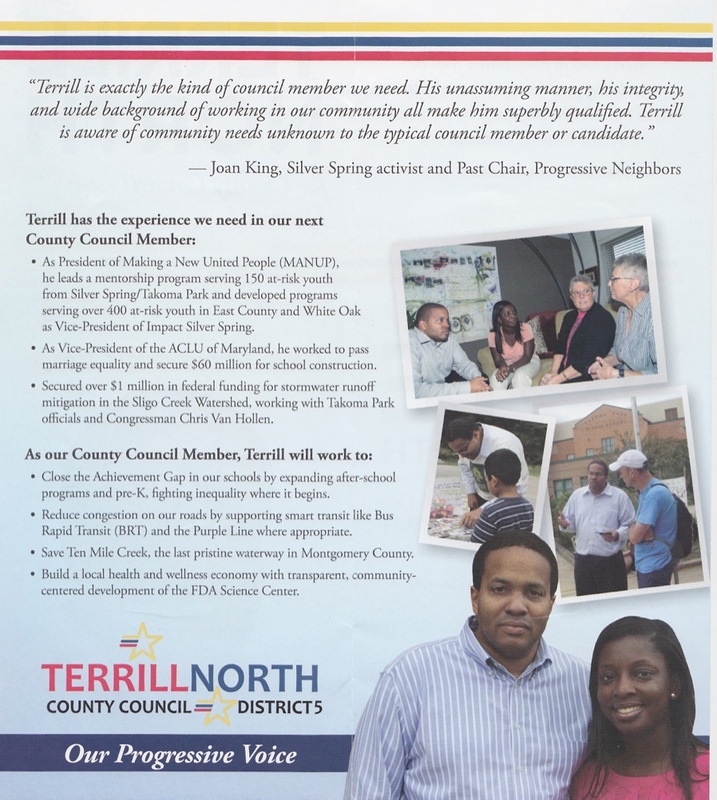 In a post yesterday, I pointed out that Terrill North, a candidate for Montgomery County Council District 5, included a quote from Sen. Jamie Raskin on his campaign literature that indicated an endorsement that he did not have. I was sharing comments that Sen. Raskin made at a campaign fundraiser last fall, much of it has been posted online at http://www.youtube.com/watch?v=42CwihDTBis since November. My goal was to share what Jamie has said publicly about my work helping over 750 at-risk youth in District Five each year through M.A.N.U.P. and Impact Silver Spring (which was the context of his remarks). I didn’t mean to imply a formal endorsement, just to share what Jamie has said about me with people that are just now getting to know me. I assume he has positive comments about most of the folks running for office this year because 1) it’s hard to work for progressive change without getting to know Jamie and 2) that’s the type of person Jamie is. My apologies for any confusion and feel free to contact me directly at info@terrillnorth.com anytime with any questions or concerns. 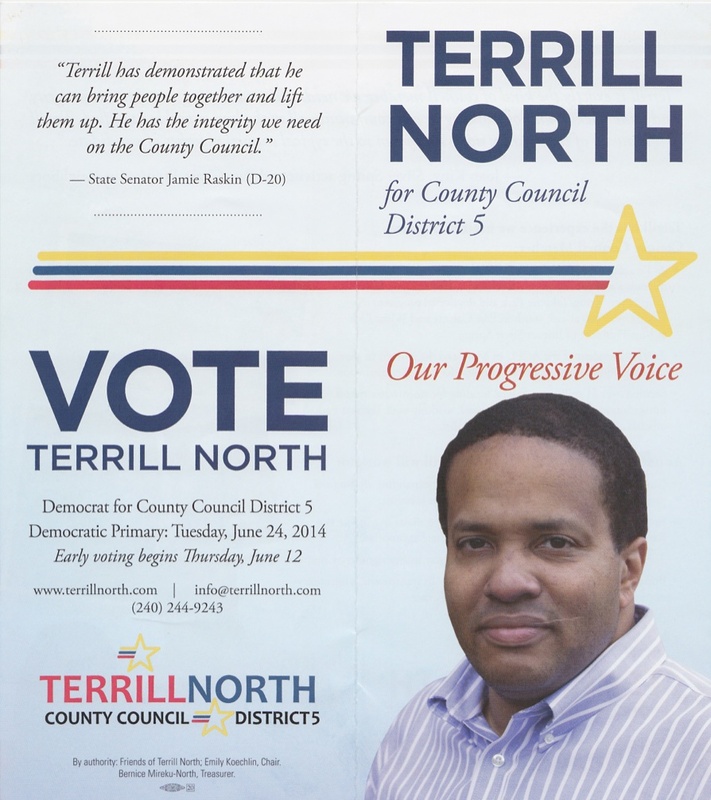 Montgomery County Council District 5 Candidate Terrill North has provided what educators call “a teaching moment” about campaign literature. Two of North’s lit pieces, one above and one below, contain quotes from Sen. Jamie Raskin, a popular guy in District 5. North also has photos with Raskin on his website. 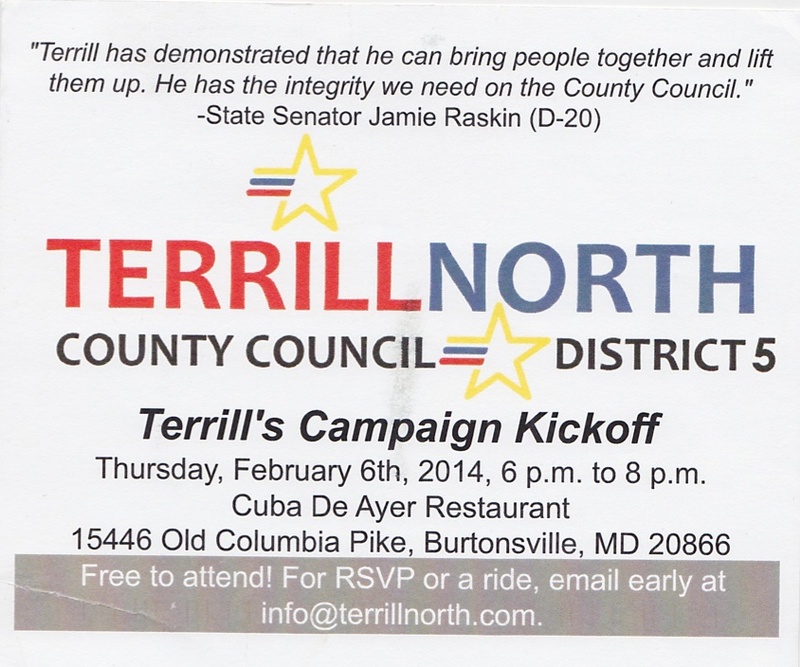 Except that Raskin has not endorsed North. The quote is from when North was going to run at-large. Candidates should not use (1) quotations or (2) photos of other elected officials without their permission. Not in their literature, web sites, Facebook pages or anywhere else. Some think this is just fine. It’s not. It is misleading and dishonest to imply support that you don’t have. I’ve included the third piece, actually the back of North’s first piece, as a counter example. Here, North lists his past efforts and goals for the district. That’s great. I hope we see more of that instead of quotations that imply support from non-endorsers.